Any love for the old school? I have occasionally played with wooden racquets just to get back that “ball feel” and to make sure I don’t get lazy with my feet or technique. I can’t spin the ball like I do with my customized Babolat Pure Drive Originals, but it’s enjoyable to hit with wooden racquet. You really feel the ball on the strings which is a completely different thing to most stiff spin monsters these days. Right now, I have a few wooden oldies in my collection. Everything I have is always for sale as the collection is constantly changing so if you’re interested I can surely give you a good price. 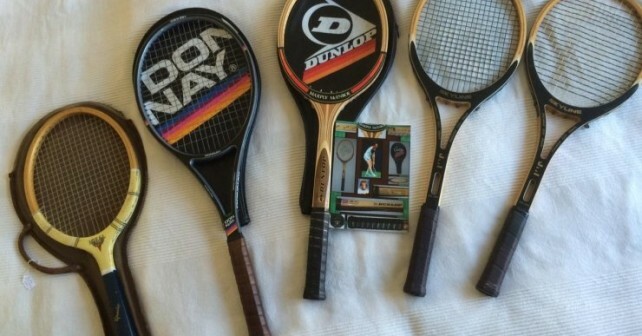 In the picture you have a Dunlop MaxPly McEnroe in the middle. A true classic that’s never been strung. 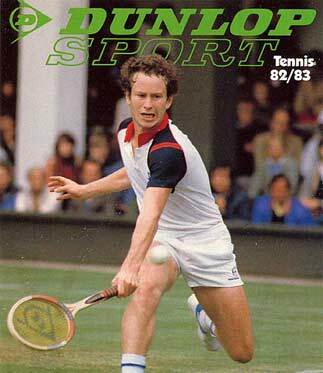 It was the last wooden racquet model that McEnroe used, based on the popular Dunlop MaxPly Fort and came out in 1982. In 1983 he went on to the graphite revolution with the Dunlop Max 200G. To the right of the Dunlop MaxPly McEnroe you have two Japanese classics, JMI Skyline Slitshaft, one of the first models to try to split the shaft in the nowadays classic manner. First racquet to the right on the picture is a Swedish wooden classic called Ideal Upsala Hultman and the second one is a graphite classic called Donnay CGX 25+. The Donnay actually still hits a really good ball! If you love old school racquets, let me know in the comments. Would be nice to hear about your collection and I’ll gladly post pics of it on this blog. My bf luvs the Dunlop maxply McEnroe 98 racquet. Does anyone want to sell one? Or know where I can get one not too much $$$. His is really getting scraped up on the head. Thanks. Hi, I saw your interesting website,and I also have a unplayed dunlopMaxplyMcEnroe racket, in the cover, near mint condition. Any clue what it’s worth nowadays? Thanks in advance for your reply, greetings from the Netherlands, kind regards, Maarten. Just saw your post about vintage rackets. I Googled JMI Skyline, because I have 2 of them, never strung. Had them since the late 70’s I guess. Honestly don’t remember getting them, but I played a lot back then. (trying to get back into it now.) mostly used a Donnay Borg model when I last played, but the kids left it in the rain. Warped now. Always wanted a Dunlop Max-Ply Forte. Never got one. Anyway, enjoyed your post. Thinking about getting the Skyline strung and giving it a try. Wondering if most shops even string them?